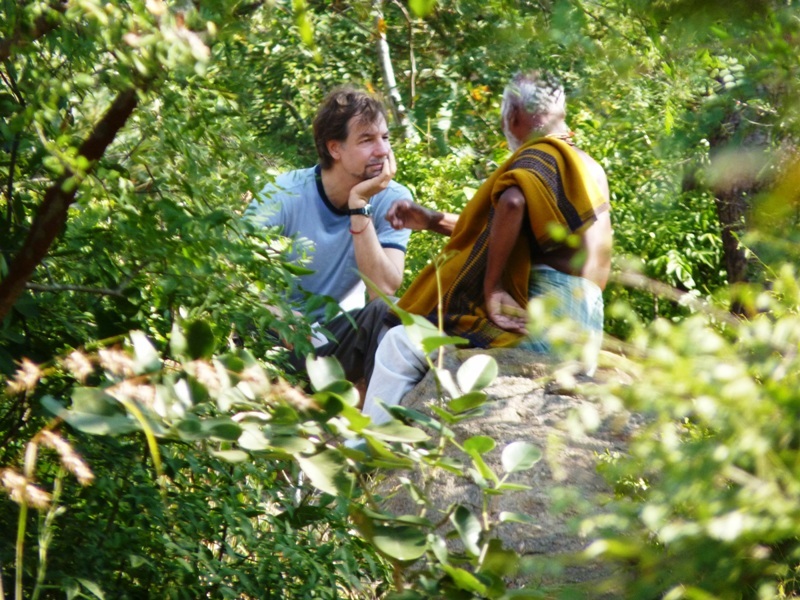 Ashrams as spiritual retreats are a magnet for visitors seeking for the spirit of India. Certainly, the practice of tirtha-yatra or pilgrimage has been an important element of Indian social life since ancient times, and nowadays remains the mainstay of the domestic tourism industry. There is little doubt that India also continues to attract large numbers of travelers from various parts of the world seeking to experience spiritual India. Visiting ashrams is an important part of such religious and spiritual tourism. In this and the following three posts I will share some of the thoughts I had penned down for that talk, about eight years ago. Summer 1947. Just a few weeks before the much-awaited independence of India won after a long freedom struggle against British Empire. Freedom has been won, but at a heavy price of partition of India. A small group of people with three young children, the youngest being a boy of 13, are among the millions of families who would be forced by the bloody and dangerous times to leave behind almost everything they owned and migrate from what is now known as the nation of Pakistan to the newly divided India. This particular family’s intended destination is an Ashram near the holy town of Haridwar. The reason they decide to go to this Ashram was simple: this was the only place in what was a foreign India to them that the grandfather in the family could call ‘home.’ This was the place where the family would literally take ashray, refuge from the treacherous journey across the border, refuge from the horror and misery of those times. Here they lived for almost 7 years till they could afford to build a home for themselves. In this Ashram lived a saint, who was the guru for my great grandfather. The 13-year-old boy is now my father who still remembers those first years he spent at the Avadhoot Mandal Ashram near Haridwar. As the above story suggests, the Sanskrit word ashray – refuge or shelter – may partly describe the role of an ashram. In one sense, an ashram may be a place where one finds some type of refuge and protection from the troubles of world, a place of retreat for body, mind and soul. The term ‘ashram’ is literally derived from the Sanskrit word srama, which may mean religious or spiritual exercise, or more broadly, to do labour, to work for one’s spiritual release or liberation. It is important to note that srama or work forms the foundation of life in an ashram. This suggests that in order to attain something, including spiritual growth and self-development, one has to struggle and put in sincere effort, do serious labour and practice discipline. More generically, the word Ashram is used to describe a spiritual community or institution, usually established by a self-realised and enlightened sage or guru. Today, the term ashram also refers to an intentional community formed primarily for spiritual upliftment of its members, often headed by a religious or spiritual leader. There are innumerable ashrams in India (and elsewhere) ranging from the homes of gurus to large, purposefully built establishments with resident populations of disciples of specific spiritual traditions and paths. The word Ashram often conjures up the image of a hermitage where saints, sages and their disciples live in peace and tranquility amidst nature. In other words, a refuge or retreat from the world. Traditionally, ashrams were usually located far from human habitation – far from the maddening crowd, so to speak – in forests or mountainous regions, amidst tranquil natural surroundings conducive to spiritual instruction, contemplation and meditation. To this day the Himalayan terrain is full of ashrams and hermitages where residents and guests participate in the practices of various spiritual disciplines and exercises. Asana, Pranayama, structured instruction in spiritual philosophy, satsang, kirtans, chanting, swadhayaya, self-study are some of the main practices in which residents of an ashram may engage. A simple, communal lifestyle in which everybody contributes according to their ability and aptitude is often the basis of collective life in most ashrams. Like in the ancient times, many of the present-day ashrams also serve as gurukulam or residential schools for students of a spiritual discipline or path. However, many of these schools are not exclusively meant for spiritual instruction, education in many so-called secular subjects is also imparted in these ashram schools. Many of the modern ashrams also provide various other services such as hospitals and Ayurvedic treatment centers at no or nominal cost, some also engage in a number of charitable and philanthropic activities such as running orphanages and shelters for people in distress. Most ashrams also have guest houses for visitors. Ashrams have been a powerful symbol in Indian history. Most Hindu kings are known to have had a rajguru, royal teacher, a sage who would advise the royal family in religious or spiritual matters, or in times of crisis. A world-weary emperor going to his guru’s ashram and finding solace and tranquility is a recurring motif in many Indian legends and folktales. The goal of a pilgrimage to an ashram was not always tranquility, but instruction in some particular art, especially warfare. This is an interesting point because it suggests that many of the sages and highly learned rishis in ancient India were also great authorities in various ‘secular’ realms, some of them were great scientists and experts in the development and use of highly sophisticated weaponry. This contradicts the usual stereotype that India was only the land of world-negating spirituality and all rishis and sages of India focused exclusively on attaining Moksha and escape from the mundane, temporal world. 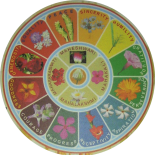 The tradition tells us about the ashrams of sages such as Vashishtha, Viswamitra, Agastya and others, where people of all social classes would visit and relevant sciences and subjects were taught to them according to their aptitude and needs. In the Ramayana, the young princes Rama and Lakshmana go to Rishi Vishvamitra’s ashram to protect his yajñas from being defiled by emissary-demons of Ravana. After they succeed in their mission, the princes receive martial instruction from the sage, especially in the use of divyāstras (highly sophisticated and rare, heavenly-inspired missile weapons). Many years later when Rama, Lakshmana and Sita are exiled to live in forest for 14 years, they would again visit several ashrams of the well-known sages of the time. As per the Bhagavata Purana, Sri Krishna was a resident-student at the ashram of sage Sandiipani, where he gained knowledge in both intellectual and spiritual matters. In the Mahabharata, we learn of the Pandavas who after losing their kingdom and all their possessions in the dice-game spent many years of their exile term visiting and living in different ashrams. Thanks for your comment, Gauri. I guess commercialism is the predominant theme of our times, very few things and institutions can keep themselves untouched and unspoiled by that. I would rather look for inspiration toward those which are still trying to fulfill their deeper purpose despite the challenge of money-making and commercial instinct. Hope you will come back for rest of this series 🙂 Thanks again for stopping by! Like you mentioned, we all need a break from the mundane temporal world and what better place than an ashram to seek spiritual awakening. Yes, Ashrams most definitely provide that function. And they also do much, much more. Thanks Purba for stopping by! And welcome to Matriwords. Thank you Prabir da for reading. And welcome to this new blog, matriwords. Well, Amit next time you are in Pondicherry, don’t forget to let me know, would love to meet and talk more about Ashrams and poetry 🙂 Thanks for reading this one. This entry was posted on May 21, 2015 by Beloo Mehra in India and tagged Indian Culture, Spirituality in Life.